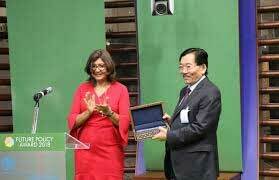 United Nations, Oct 16 (IANS) Sikkim Chief Minister Pawan Kumar Chamling received the UN Food and Agriculture Organisation’s (FAO) Future Policy Gold Award from its Deputy Director Maria Helena Semedo, who commended the Himalayan state for setting an example to the world by becoming first totally organic state. Nicknamed the “Oscar for best policies”, the award is co-organised with the FAO by The World Future Council (WFC) and IFOAM – Organics International, and recognises “the world’s best laws and policies promoting agroecology”. Presenting the award, Semeda said: “Sikkim is an outstanding example on how to successfully transform the food system and ensure respect for people and planet” and the award recognises the state’s leadership and political will. Sikkim’s transition to organic farming “has benefited over 66,000 family farmers, reaching beyond just organic production to include socioeconomic aspects such as consumption and market expansion, rural develoment and sustainable tourism with its comprehensive and inclusive approach”, she said. At the ceremony, a film was shown highlighting how the state achieved the transformation through research, marketing and education for farmers. The award recognises the policies adopted by the state starting with a political commitment to support organic farming in 2003 that led to the 2010 Sikkim Organic Mission. The state’s policies and commitment led to it becoming the first 100 per cent organic state. Sikkim beat 51 other nominees from around the world for the award. Brazil, Denmark and Quito, Ecuador, shared the Silver award. Vandana Shiva, the environment activist and president of the Navdanya International, presented the silver award. Earlier on Monday at a news conference held at the Chamber of Deputies in the Italian Parliament, Chamling said that organic farming was a form of action of non-violence. When his government embarked on the organic farming mission in 2003, it was confronted by opposition parties and vested interests of the chemical sector, but through hard work backed by a strong political commitment Sikkim was able to overcome the odds and become totally organic by 2015. Now several Indian states like Kerala and those in the northeast were trying to follow the example of Sikkim, he said. It was important to involve the youth in the organic mission and many educated young farmers in the state have developed marketing strategies that take the state’s produces to places as far away as Delhi and Bengaluru, he said. The news conference was hosted by the leaders of the Italy’s Agriculture Commission and Environment Committee, who praised Sikkim’s achievement as a trendsetter for the world. Italian MP Rossella Muroni, the Free and Equal Party leader on the Environment Committee, congratulated Chamling and Sikkim for their pioneering work and showing how organic farming is possible. Maria Chiara Gadda, the Democratic Party leader at the Agriculture Commission, said that Sikkim was an inspiration for striving towards sustainable organic farming.